The first regional tournament in the northeast exclusively for non-Life Masters,the Gold Mine Regional is history. Results of this tournament and the GNT qualifiers can be found here. The Winners Boards (photos of winners) are on the same page. New ranks: The list of players who advanced in rank in March can be viewed here. Congratulations to the six teams that will represent New England in the Grand National Teams at the North American Bridge Championships in Las Vegas. The winners can be found here. The beautiful Sea Crest Beach Hotel in North Falmouth, MA, will again host the district's Cape tounaments April 24-28. 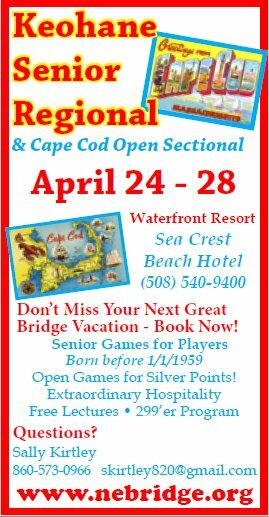 The Keohane Senior Regional/Cape Code Open Sectional offers players the only chance this year to earn both gold and silver points in on tournament. The regional events are limited to players who are 60 or over. The flyer can be viewed by clicking on the ad in the column at right. This year's tournament will feature a new kind of Monster Knockout on Thursday and Friday. Tournament Director Peter Marcus has written a detailed description of how knockouts, including the ones using the new format, work. You can read it here. The new District Director, Bob Bertoni, has developed a website for himself. It includes lists of players who advanced in rank as well as the responses to his emails of congratulations to them. You can check it out here. Purchasing entries at D25 events is now easier and faster. NEBC treasurer Joe Brouillard has written a description of the new vouchers here. Problems regarding conduct and ethics are addressed by the District Recorder. Neil Montague has written an introduction to this process, which you can read here. The final standings in the Best in Class awards for all fifteen classifications are posted here. The rules for the Regional Tournaments Masterpoints Race have been changed to include GNT and NAP points. The results for 2016, 2017, and 2018 are posted here. District 25 now subscribes to a service that provides online Bulletins (including results) for each day of our regional tournaments. 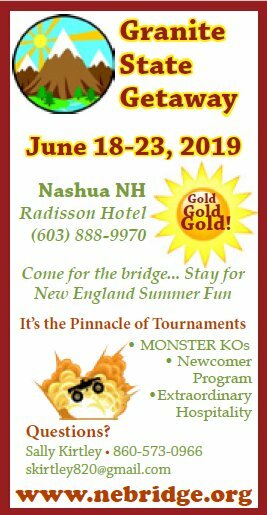 This will be supplemented by a printed Bulletin that contains a great deal of information about bridge in New England and the tournament in particular. However, it will no longer contain results. Links to the online Bulletins are automatically sent to the email addresses of those attending. You can also find a list of all of the online Bulletins on this page. There are also links on the results page. The online Bulletins also contain photos of winners of each strat of each event. 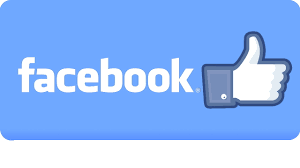 The service can only include a photo if they have an image file in the appropriate format. If you would like to have your photo included, send a jpg file to FastResultsHelpDesk@gmail.com. The image must have a maximum height of 150 pixels, and the name of the file should be your ACBL player number. If you do not know how to do this, just send the photo to webmaster@NEBridge.org. If your photo has appeared on the website within the last few years, and you would like it submitted to Fast Results, send an email to the webmaster. If you do not know if the website has your photo, check the index by player. The online Bulletin can also list the names and photos of players who achieve Life Master status at the tournament. If that milestone occurs, please send an email to the webmaster with the player's name and other details. If you have any ideas for the printed Bulletin, or you would like to submit something for inclusion in it, contact the webmaster. A tab has been added at the left: "Tips for Tournaments." It contains links to short articles about playing in tournaments sponsored by District 25. Two of the articles are new. One serves as an introduction to playing in Regional Tournaments. The other concerns the new Continuous Victory Point Scales that will be used in some Swiss events. Minutes: Carolyn Weiser, District 25's secretary, has provided minutes for the most recent meeting of the Executive Committee, the body that makes the most important decisions about the course of bridge in New England. You can read them here. The minutes for the latest Board of Delegates meeting are here. Note: Minutes are not posted until they have been approved, which generally happens at the next meeting. 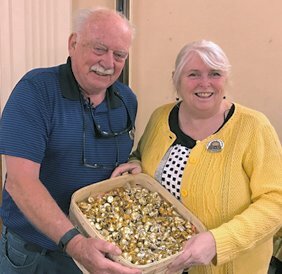 Minutes from all recent meetings as well as lists of members of the Executive Committee and the Board of Delegates can always be found under the "Officers & Admin." tab at left. Winners Boards: NEBridge.org publishes photos of the winners of every strat in every event of every tournament sponsored by the district. Sad to say, the pages that contained the photos for 2014 and the first half of 2015 were lost in last summer's hardware catastrophe. However, the pages for all tournaments beginning with Hyannis in 2015 are available. The indexes have now been reconstructed.They are both available in the "Tournament Results" tab at left. The index by player can also be reached here. The index by tournament, date, and event is here. Please notify webmaster@NEBridge.org if you find any mistakes or want to submit a photo. It is never too late. District 25 is definitely social. To keep up with the bridge news and gossip in New England check out our Facebook (NEBridge) page or follow us on Twitter (@NE_Bridge) or both. Twitter is very easy and non-threatening; for instructions on how to use it, just email webmaster@NEBridge.org. New England Youth Bridge, Inc. has been working hard to showcase this great game to the video-game set. They urgently need our help. Details can be read here. We strive to keep the website informative and easy to navigate. Please “Contact Us” if you have any questions or suggestions regarding District 25, the site, or anything else.